Isis is a goddess who is a totally timeless expression of the Divine Feminine; she is as relevant today as she was in ancient times. Devoted to empowering others, Isis supports the awakening of humanity as we head into a new World Age. She brings value and respect to the roles of wife and mother, is the patron of magic, nature, and healing, and is considered a protector of the dead. As a matter of fact, the singer Rihanna recently had a very large tattoo done below her breasts of Isis with her wings outstretched as a tribute to her late grandmother. It is said that Isis stretches her wings over the foot of the casket to protect the dead. Her compassion, love, and tenderness have made her especially dear to women throughout time. As the protector of women, Isis helped women in childbirth and comforted women when their loved ones died. She shows us that women have great reservoirs of strength and inspiration. Isis reconnects us with our innate healing powers, and so is beloved by healers. She supports everyone’s quest to reclaim their individual power and take responsibility for their healing journey. She shows us our ability to heal ourselves and to heal others. Isis can help to awaken your healing abilities and healing intuition, your ability to communicate with the physical body and to intuit any needs you may have for healing. She empowers you to use the healing power of love and gratitude and to raise the energy level of the physical body by connecting to Source. In the myths of ancient Egypt, Isis and her brother/husband Osiris were the divine rulers of the gods. Overcome by envy and seeking to gain more power and control, her brother Set killed Osiris. Everything Isis does is done with great power and intention. Her grief over the death of her husband was so great that it was said her tears of sorrow caused the Nile to flood. 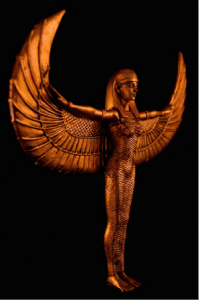 Isis is actually one of a very few deities that have wings in Egyptian mythology, which in her case may represent the wind. In the Osiris legend it is said that Isis wailed and moaned like the wind. These days, we often conceal our grief, and are expected back at work the day after a funeral. We have forgotten how to mourn, how to honor the process of grieving. Isis reminds us that grief is a powerful part of our experience in life and should not be repressed. Grief that is not expressed can eventually become physical illness. The basis of the Isis-Osiris myth is the wheel of life, death, and rebirth, with Isis as the Giver of Life as well as the Queen of the Underworld and the Guide to the Dead—representing the deep mysteries of the feminine ability to create and to bring forth life, even from death. Isis couldn’t accept the death of Osiris and used her abilities to resurrect him, at least long enough to conceive their child Horus, who became the God of the Sun as Isis was Goddess of the Moon. When Set “killed” Osiris a second time, Isis collected the remains and performed the very first embalming. Isis is also known as the Lady of the Words of Power. In another myth, Isis tricks Ra, the God of the Sun, into revealing his secret name by making a snake bite him, and she is the only one who can cure him. Ra was an uncaring deity, and the world suffered under his reign. When Isis uttered his secret name, Ra was healed, but she was able to claim his powers of life and death and soon became the most powerful of the Egyptian gods and goddesses, using her powers to benefit the people. Once she had his secret name, she had the power to manifest and create with words. So Isis reminds us of the power of our words and cautions us to choose our words carefully. Isis often is implored to “use the true name of Ra” during rituals. Not much survives about the ancient Egyptian rituals for Isis, but it is clear that both priests and priestesses officiated at her cult. By the Greco-Roman era, many of her priests and priestesses were considered to be healers with special powers, which included the interpretation of dreams and the ability to control the weather by braiding or not combing their hair (the Egyptians believed knots had magical powers). Isis had a central role in Egyptian magic spells and ritual, especially those of protection and healing. When her son Horus was wounded, she healed him with the power of her milk, and that became a standard feature of Isis’s healing spells that invoked the curative powers of the milk of Isis. As a healer, Isis also used spells, a healing rod, and sacred rattles and cymbals. Together with the god Thoth, she taught mankind the secrets of medicine. The ancient Egyptian goddess has many gifts to share with modern men and women and is a symbol of the return of the Divine Feminine. Isis embodies the strengths of the feminine, the capacity to feel deeply about relationships, and the source of sustenance and protection. The myth of Isis and Osiris also remind us of the need for renewal and reconnection in our relationships, as well as a reminder to acknowledge and accept our emotions.